The "Internet of Things" refers to the idea of pervasive, ambient connections between physical objects and the virtual world. If every modest sensor or output device could share information via the internet, what new paradigms will arise? Our little printer is one such experiment. What value can be culled from the internet without a browser interface, or even a computer screen for that matter? 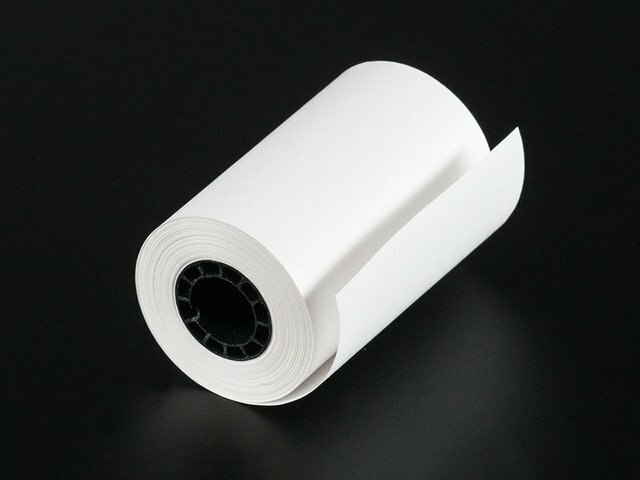 50' roll of thermal paper. 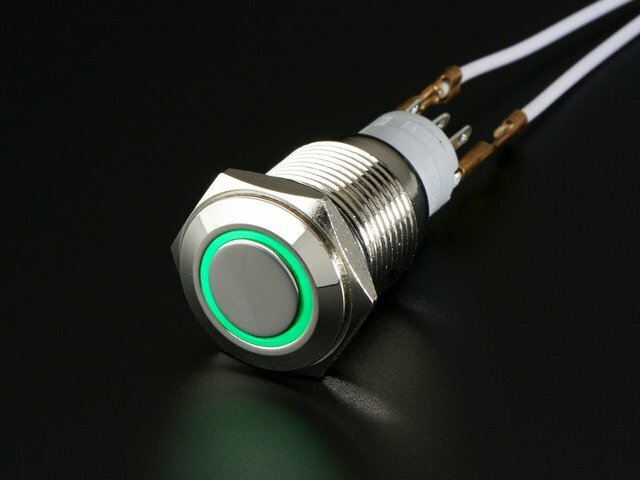 Metal on/off toggle button with green LED. 5V 2A DC switching power supply. Break-away strip male header (single piece similar to product ID #400). A short length of ribbon cable. Seven (7) laser-cut acrylic pieces - information on these is here. Eleven (11) 1/2" #4-40 black nylon machine screws. Twelve (12) #4-40 black nylon nuts. Not shown: a short length of heat-shrink tube. an Arduino Ethernet board and a USB-to-serial programming adapter such as the FTDI Friend or TTL-232 Cable. an Arduino Uno board and Ethernet Shield. Cables for USB programming and Ethernet. Not shown: wire cutters and strippers, lighter or heat gun for heat-shrink. If using the Arduino Ethernet (board, not shield), gently remove the 6-pin 90-degree male programming header from its socket. If using the Arduino Uno + Ethernet Shield, remove the Ethernet Shield if it's currently installed. Peel the backing paper off the acrylic parts. This may create a static charge, so building the kit with a grounding mat or wrist strap is recommended. If using Ethernet Shield, there's an extra cutout on the back piece of the acrylic case that can be snapped off using finger pressure or pliers. If sharp points remain, trim with wire cutters or a file. If using the Arduino Ethernet, leave this cutout in place. Note the unique Ethernet MAC address on the board — usually a white sticker on the bottom. You will need this later, so write it down or snap a photo. 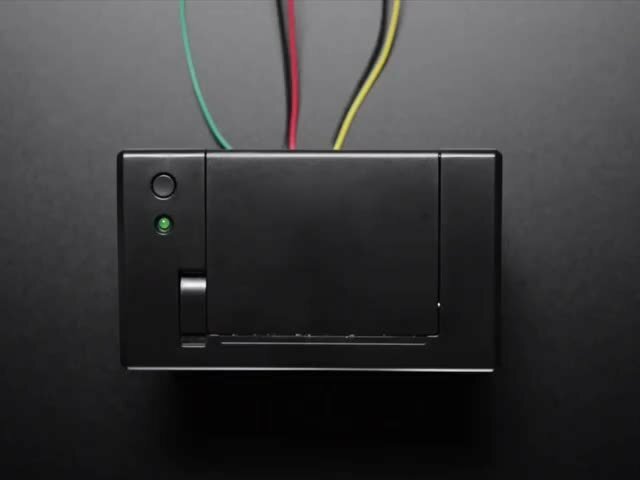 First, retrieve the thermal printer Arduino library from our repository on GitHub. Click the DOWNLOAD ZIP button, extract the archive and then rename the uncompressed folder to "Thermal". Confirm that this folder contains the files Thermal.cpp and Thermal.h and the examples folder. Second, download Cryptosuite, another Arduino library. When extracted, rename this folder to Sha and confirm the files sha1.cpp and sha1.h are inside this. Finally, download the Adafruit "Tweet Receipt" code from its own repository, extract the archive and then rename the uncompressed folder to Gutenbird. Confirm that this folder contains the file Gutenbird.ino. This code is reliant on Arduino 1.0 features and will not work with Arduino 0023 or earlier. Place the Thermal and Sha folders inside your Arduino libraries folder. You may need to create this folder if it does not yet exist. In Windows, this would be (home folder)\My Documents\Arduino\Libraries. For Mac, (home)/Documents/Arduino/Libraries. And for Linux, (home)/sketchbook/libraries. We also have a tutorial on library installation. Place the Gutenbird folder inside your Arduino sketch folder (one level above the libraries folder). In addition to some basic account information, you’ll need to provide a real email address in order to confirm and activate the account. Within a few minutes you should receive an email with an activation link. You’ll be asked for some basic information about your application — the tweet-printing program we’ll be loading on the Arduino. Provide a reasonable name and description…we don’t know if applications are audited, but being honest and descriptive here would be helpful. You also need to provide a Website URL. If you have a personal or company web site, enter that on the form, else you can use Adafruit’s home page. Once you complete these steps, you’ll have the full set of credentials needed to authorize your application. In a moment we’ll copy and paste these four strings into an Arduino sketch: Consumer key, Consumer secret, Access token, and Access token secret. Do not share these strings with anyone—they’re for the secure and exclusive use of your application. If you’re sharing source code via Github or other management system, remember to remove these before posting the code! If using an earlier Arduino Uno “R1” or “R2” board, you might encounter the issue below. If you have a current “R3” board, skip ahead to the “Edit Code…” section. FIX 1: If you build a lot of projects and have an Arduino Uno R3 handy, swap it out. Dedicate the R3 board for Gutenbird and use the R2 for the majority of Arduino projects that aren’t quite so demanding. This is the easiest option, if you have the spare board. FIX 2: Update the bootloader on the older Uno using directions on Arduino.cc. A second Arduino is required during the upgrade, and there’s a small risk of “bricking” your R1/R2 board, so this option is best left to advanced users. You'll now need to edit the Gutenbird sketch to match all your particular settings. First, copy and paste the four authentication strings from your Twitter application page to the corresponding spots in the software, keeping the quotes around them. The order of these strings in the code does not match the order on the Twitter form — be sure to copy each to the correct position! As written, the sketch will search for Tweets originating from Adafruit, but you can change this to any search string supported by the Twitter Search API. Refer to the SEARCH OPERATORS section of the Twitter Developers Documentation for guidance. Edit the Ethernet MAC address to match the value you previously wrote down from the sticker on your Arduino Ethernet board or shield. The code uses DHCP (which dynamically assigns an IP address) by default. If your network doesn't use DHCP, or if you just want to provide a fallback address in case of a problem, edit the IP Address value in the code. 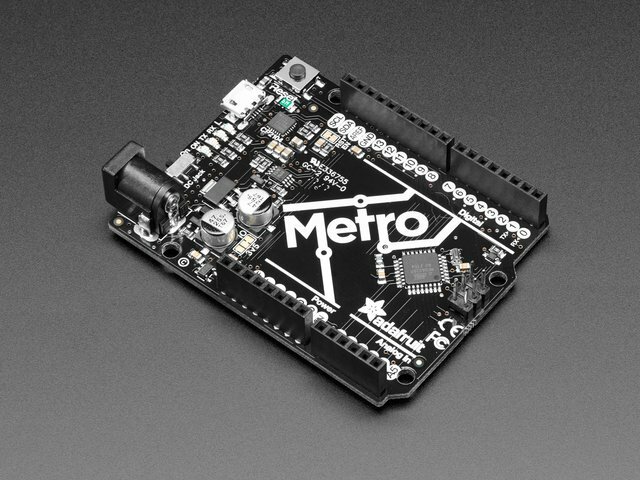 If using the Arduino Ethernet board, flip up the front face of the enclosure and connect an FTDI Friend or other USB-to-serial adapter to the programming header on the board. If using an Arduino Uno, use the USB port on the back of the box. Select your board type and serial port from the Arduino IDE Tools menu, build the sketch and upload to the board. USB can now be disconnected; the box will operate standalone.